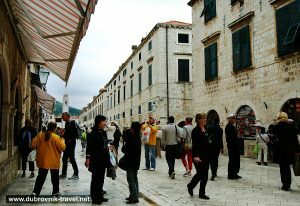 Stradun (or officially ‘Placa’) is the main street in Dubrovnik Old Town. 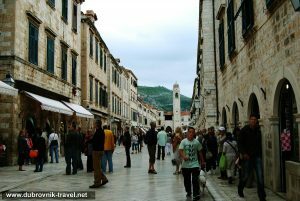 It divides the Old town (part of Dubrovnik built within medieval walls) on two, more or less, equal parts – northern and southern. 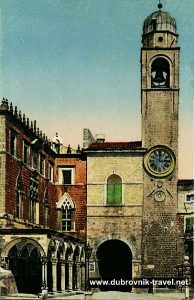 Stradun is stretched from Pile Gate (western entrance to the old town) to the Old Town’s port. 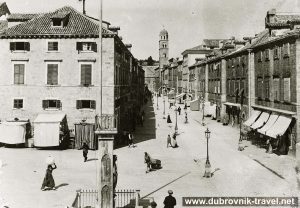 It used to be a channel that divided small island on which Dubrovnik was built from the mainland. 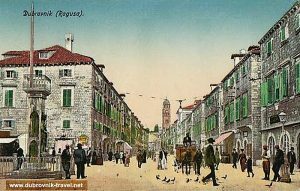 Later on, the channel was filled to create the main town’s street. 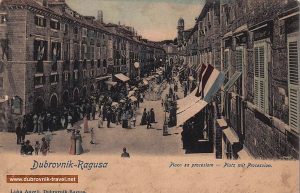 The street is completely pedestrianised for almost 50 years and acts as the main local promenade. 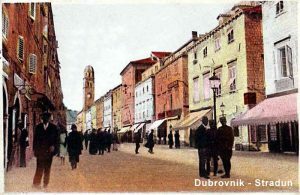 As Stradun is closed to traffic, making it accessible to pedestrians only, both sides of the street are stuffed full of cafes, shops and restaurants. 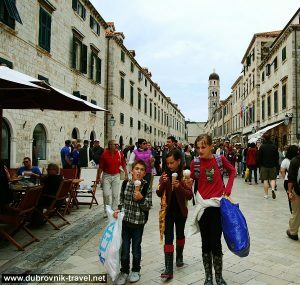 If you come to Dubrovnik, there is no way you can miss this promenade. 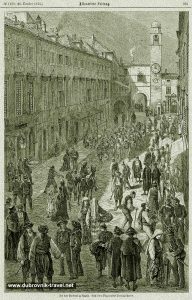 Not for the reason that all routes simply lead to it, but because if you follow the crowd you will arrive there sooner or later. 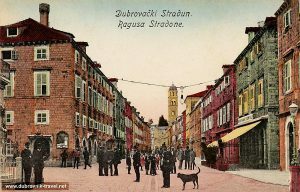 Nevertheless, it is important to mention that most of the streets in the Old Town leads to Stradun (see it on the map of Old Town). 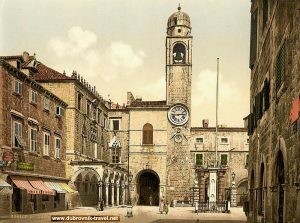 The best way to enjoy Stradun is to take a walk up and down the street. 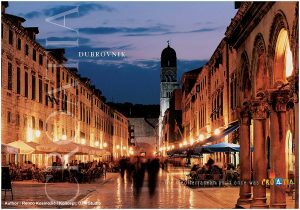 Once you get tired a bit, sit in front of one of the cafes, get your drink and enjoy watching passing crowd. 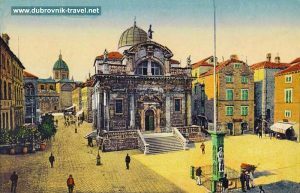 You can do the same if you sit on the steps of Sveti Vlaho Church or in front of Orlando’s Column (my favourite place). 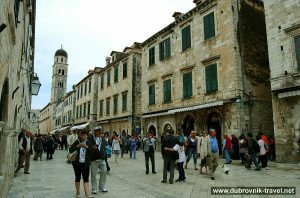 Another nice place to enjoy views of the street is to get to the top of Dubrovnik Town Walls from where you can see Stradun (as well as the rest of the town) from the bird-eye perspective. 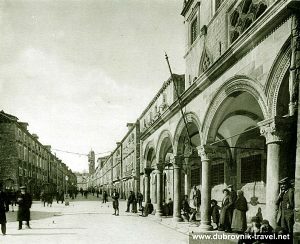 Every time I visit Dubrovnik, even if I’m just passing by to the airport, I try to spend at least an hour on Stradun as I find it an inspiring place to be. 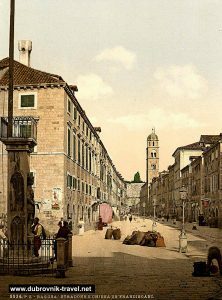 Although the official name of Stradun is Placa, no one calls it by that name – except (sometimes) tourists. 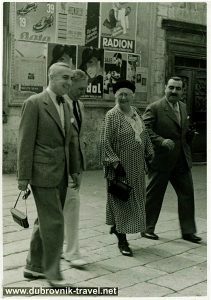 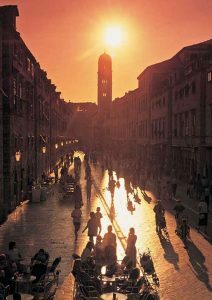 So, if you want to do as locals do, always refer to it as “Stradun” – the locals will love that ;). 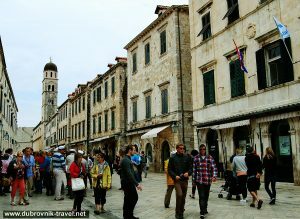 I took below video clip recently when visiting Old Town for just one day.